Evolution -- The largest Deep Web drugs marketplace, disappeared suddenly overnight from the Internet. But unlike Silk Road, there is no indication that the law enforcement took down the Evolution marketplace. 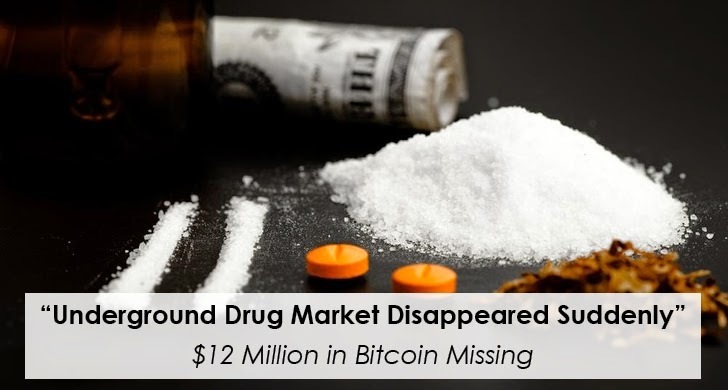 The Evolution black marketplace opened in January 2014, and gained popularity after the shutdown of Silk ​Road and arrest of its unassuming founder, Ross U​lbricht, with a promise of less fraud. Like Silk Road, Evolution also dealt in drugs, as well as illegal weapons, counterfeit goods, stolen credit cards and guides to committing fraud. Evolution was only accessible through anonymity Tor network. At the time of its apparent vanish, Evolution was home to nearly 20,000 drug sales, far more than Silk Road or Silk Road 2. In order to buy or sell goods, a user just need to registering an account for free. Once registered, users could browse thousands of user-submitted list of illicit goods -- from weapons like guns, tasers hidden in fake cigarette packets to plenty of other fraud material -- and buy products with digital currency Bitcoin. Evolution was also slicker, faster and more professional than other dark web marketplaces. It also promises greater trust to its customers due to its centralized "escrow" system, the supposedly security feature that actually allowed the site’s admins to make off with its users’ Bitcoin. Evolution holds the vendors’ Bitcoin funds in the site’s centralized "escrow" system before Evolution’s administrators and the two of the parties involved in a transaction signed off on transactions. However late Tuesday, a post on the r/darknets​ subreddit made by a user named NSWGreat claimed to confirm that the Evolution’s administrators—Verto and Kimble—had shut down the market, and escaped with users’ bitcoin funds stored in the market’s "escrow" vaults. "I have admin access to see parts of the back end, the admins are preparing to exit scam with all the funds," NSWGreat wrote. "Not a single withdrawal has gone through in almost a week." After confronting Kimble and Verto, NSWGreat said the administrators "confirmed they are doing it right now," later adding that "yes, this is real, no this isn't maintenance." If the posts on Agora and Reddit come out to be true that the Evolution administrators did scam, the stolen amount could be in the Millions of dollars, as users were having tens of thousands of dollars worth of Bitcoin in escrow vaults. "I am so sorry, but Verto and Kimble have f–ked us all," NSWGreat wrote. "I have over $20,000 in escrow myself from sales. I’m sorry for everyone’s loses, I’m gutted and speechless. I feel so betrayed." A similar sc​am was carried out two years ago at another dark web market called Sheep, one of Silk Road’s successors. However that time, Sheep administrators announced that the site had been robbed of Bitcoin by a vendor who found flaws in the system, and shut itself down. But users believed that the Sheep Marketplace’s operator scammed its customers and walked away with nearly 39,918 Bitcoins, which were worth more than $40 Million at the time when Sheep marketplace shut down. The community members are very furious about the sudden shutdown of Evolution marketplace. One warned that Kimble and Vertu have "got got 24 hours (and that is being generous) to make this right and re-open the market, and allow people access to their funds. Once that time passes - my crystal ball starts talking and unless you've changed identities and moved, you will be F----D."
Another member wrote, "I'M A VENDOR WITH EVERYTHING INVESTED IN THIS SITE, IN THIS 50+ BTC IN THE F--ING SITE..." "I OWE MONEY AND CAN'T PAY IF THIS IS TRUE... MY LIFES IN DANGER... PLEASE DON'T BE TRUE PLEASE." "Due to unforseen events I decided to close down Evolution Marketplace. We want to thank you guys for you effort and help making this the most profitable and popular marketplace. This wasn’t an easy decision but due to other marketplaces getting shut down and the forum going downhill I decided to cut my ties and exit with an eight figure profit. The millions from evo will be divided up amongst the mods a few admin and members. Since this is such an abundance of money I may consider buy ins from former evo members in exchange for 1k bitcoinis. I’ll be around around for a short period of time before permanently moving to the caribbeans, I hope you guys understand." This is really a very disappointing news for those who have their Bitcoin funds in escrow.